Behind a classic facade and set on an oversized 25×150 lot, this dynamic modern sensation is the essence of Wicker Park: unconventional, wildly exciting, and filled with cool surprises at every turn. First floor is centered on an open concept chef’s kitchen – with a 16′ island and top-of-the-line cabinets and appliances – which opens to a breakfast area and great room leading to deck, yard and 2.5 car garage. Upstairs are 3 bedrooms and 2 baths including a fabulous master suite with a wall of glass overlooking the back yard. A newly renovated lower level includes a family room w/teak built-ins and custom built-in sofa, a fantastic outfitted gym/recreation room, and a 4th bedroom suite w/reclaimed wood wall. This house has it all: perfect finishes, sophisticated lighting and hardware, high-end build-outs, attention to detail…and an off-the-charts coolness factor. Prime location across from the park and steps to the city’s best cafes, coffee houses and boutiques. Low taxes! 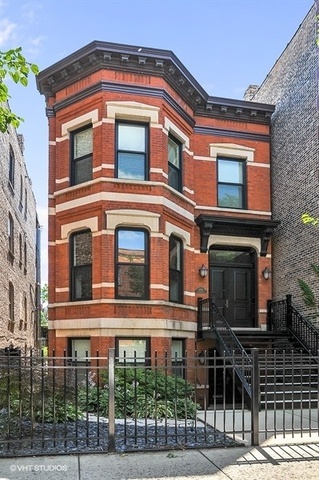 Please, send me more information on this property: MLS# 10060138 – $1,950,000 – 1829 West Evergreen Avenue, Chicago, IL 60622. I would like to schedule a showing appointment for this property: MLS# 10060138 – $1,950,000 – 1829 West Evergreen Avenue, Chicago, IL 60622.